Driving across the Cumberland Plateau, I began to have just a bit of a sinking feeling about the conditions for our upcoming workshop in the Smokies. The weather had been very warm and super dry for quite a while and the trees on the Plateau were simply brown or bare. Not a good sign! But, I did get a somewhat encouraging report from a local friend who lives near the park and that yes, the water was low, but some Fall color was still on display, in spite of the extreme conditions. And as luck would have it, on day one of the workshop we got rain! Maybe I'm a bit of an outlier but my favorite time to photograph the Smokies is during a rain shower. The waterfalls and creeks come alive and there is usually some interesting storm light hanging around the high ridges. So we started off with some fun photography along the Roaring Fork and enjoyed the fresh rain fall in the streams there. We also spent some time over in Greenbriar just exploring the fall colors and streams in one of my favorite sections of the park. The day came to an end with some dramatic waterfall images at Tremont, with a compelling combination of color and cascades. Then, we made it over to Big Creek. It takes a bit of work to arrive at Big Creek which is one of the reasons why I enjoy photographing there, far fewer people take the time to visit the more remote corners of the park. Big Creek offers scene after scene of compelling creek views and fall colors. In years where fall color might be a little hard to find, I always head to Big Creek and am never disappointed. We ended the workshop with quite a show up high. It's always a bit of an early days driving up to the Dome where it's windy and more than a little brisk this time of year. But, it was really worth at as we could see an amazing sunrise unfold right before our eyes. Fantastic group of clients who worked super hard in the field and made some compelling images. 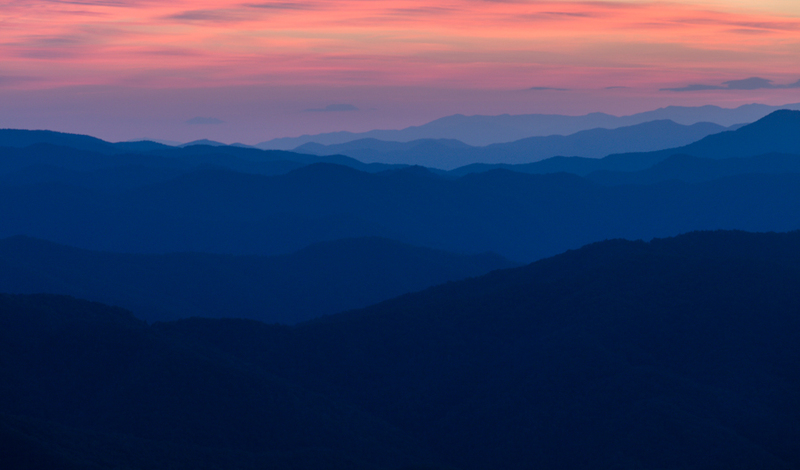 Looking forward to being back in the Smokies for the Spring workshop! Check out the link here for all our photo adventures in 2017, join us! The hike from Abiskojaure to Abisko would be our last day on the trail so it's bittersweet to say the least. Excited to greet the day's adventure but a bit sad for the last day out in the wilderness with friends. I was up around sunrise and just soaked in the soft light of the morning in the birch forest around Abiskojuare. Fantastic scenes and easy walking. Finally though it was time to pack up the tent and head North up the trail to Abisko. We took a few photos with Rob and his bike and started the day with a nice mix of sun and clouds. The terrain was gently rolling and we hiked in and out of the birch forest which colored the distant ridges in a bright gold as far as you could see. We passed a few hikers on the trail and a small herd of reindeer making their way along the edge of the forest. We stopped and took a break or two and just enjoyed the mild weather and the scenery. Eventually we encountered a beautiful rainbow from some rain showers in the distance. We seemed to be following it and must have been in our view for about 15-20 minutes. Spectacular scene. I was unfortunately hit with some waves of nausea most likely from the water I had the night before. The water sources are quite clean and pure and the taste of the water is amazing. But, with multiple people gathering the water and handling the water around the cabins it's pretty easy to get a bug in the bucket so to speak. But, wasn't too bad and didn't slow down the hiking at all. But, did however keep me in the bed that night when I would have much rather been out taking in the Northern Lights show! As you get closer to Abisko, the hiking trail mixes in with the snowmobile trail that is used in the winter season. And it's pretty easy to take the wrong fork that drops you off East of the STF mountain lodge where we were heading. We stayed on course though and eventually came to the last of the Dag Hammarskjold meditation markers. These markers are carved in a small boulder with a quote from Hammarskjold and a tall wooden post in the form of a cross. Hammarskjold was Christian mystic of sorts and much beloved for his diplomatic roles including secretary general of the UN. This final marker reminded us that the longest journey is the one within. True enough. Very appropriate as we reached the end of our 120K + hike! Just before you arrive at Abisko, the river is forced through a really rocky and narrow canyon that's lined with birch trees. Spectacular. And it's within easy reach of the mountain station at Abisko so it naturally drew a crowd of day hikers. And shortly after that we finally arrived at the end of the trail, the northern terminus of the entire Kunglseden. What a feeling it was and so we stopped for a time of celebration and photos. From there we made our way to the really nice mountain station and checked into to some outstanding lodging. They also have a gift shop and a wonderful restaurant. In spite of my sideways stomach, I enjoyed the Arctic Char, which is a local fish and maybe the best fish on the planet. Fanatic way to celebrate our time in the wilderness. The next morning I was feeling quite a bit better and we enjoyed a breakfast buffet that had just about any and everything you could possibly want. As we headed down the road on the bus back to Kiruna, I think we were all caught up in reflecting on the trip that we just completed. I would say that I plan to come back to the area in the fall and do some hiking and photographing and especially spend some time at Abisko and experience the Northern Lights. Maybe even a winter trip would be a possibility? I think too that a return trip to Kebnekaise with more time to explore the region would be fun. That's the thing about adventure, there's always another one or two that flows out of a trip. For me at least, it's important to have another adventure on the not too distant horizon. Sometimes it's better to be lucky than good. I'd like to say that we looked at the weather forecast in advance and checked the wind predictions very carefully. But we didn't. We looked at the terrain and thought a lot about where we would like to start and finish and examined the BD 6 map very carefully. We even took a close look at the Kungsleden guide book by Claes Grundsten (must have resource) and considered his recommendation which is to hike North to South going from Abisko to Nikkaluokta. In the end, we decided to hike the same direction as the Fjällräven Classic, a group hike which starts in Nikkaluokta and goes North to Abisko. Today would remind us that we would be lucky in that decision. The wind continued to blow very hard, at least 30mph but thankfully for us, it was out of the South and at our backs. We passed a lot of hikers going very very slowly into the wind. You could see the effort and the struggle on their faces. Hard going so we were feeling lucky to have the wind going with us which would be very important for the next two days. In fact the wind was blowing so hard that the hike from Tjäktja to Aleasjauore was the only day on the entire trek that I did not take a picture along the hike. There were just no areas to escape the wind and so no way to take photos in a wind that was even difficult to stand in! But, I was up early around 5:30am or so and broke camp in order to take some photos around Tjäktja. There were some waterfalls that were down in small valleys that allowed some quick photos. The terrain is rocky and kind of rolling as you head toward Alesjaure. The hike was fun actually even though there was some fierce Arctic wind blowing. Our breaks were much shorter and we enjoyed seeing several groups of reindeer along the way. We arrived at Alesjaure around 2pm and this was another nice spot to camp and hang out in the cabins with the heavy weather blowing around outside. Alesjaure has a nice kiosk for food and supplies and some nice areas to camp near the cabins. Here the cabins are situated on a ridge that sits above the lake which is really beautiful. But, this location really serves as a wind tunnel. Fortunately I found a nice spot below the ridge and pitched the tent literally under some shrubs to just get out of the heavy winds.